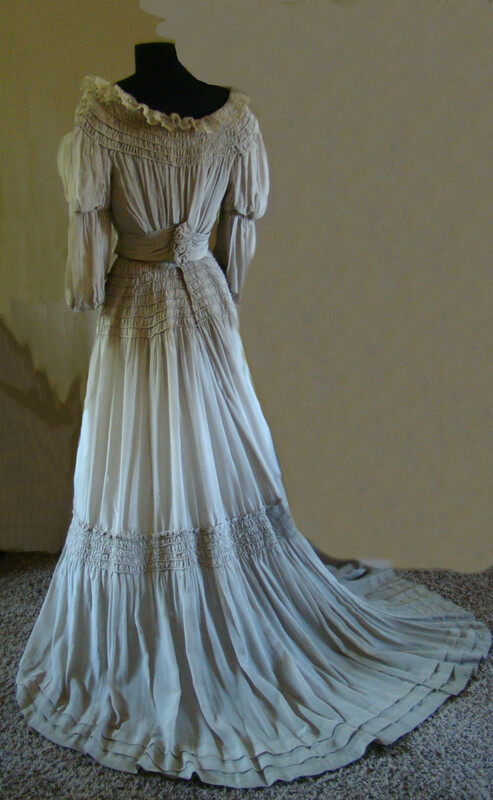 Beautiful pale dove gray silk pongee ballgown features a "Gibson Girl" profile with pigeon front, and bustled skirt (sorry, don't have a bustle to give that profile) The bodice neckline is open and extends out to the shoulders, with a 3" wide ruffle of lace circling the neckline. THe sleeves are two full poufs with a ruched band in the middle and extend to the elbow. The bodice is gathered around the neckline and waist to give the full profile. 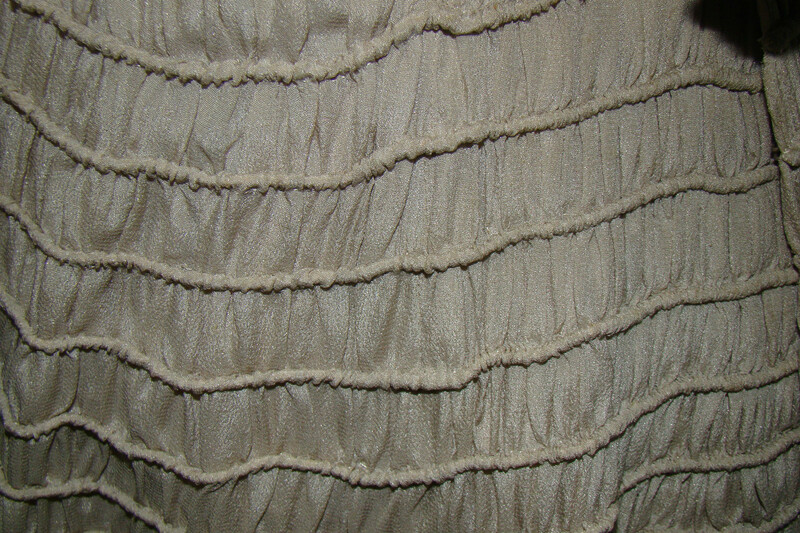 A gathered cumberbund circles the waist coming to a point in the center front and featuring three rosettes at the center back. 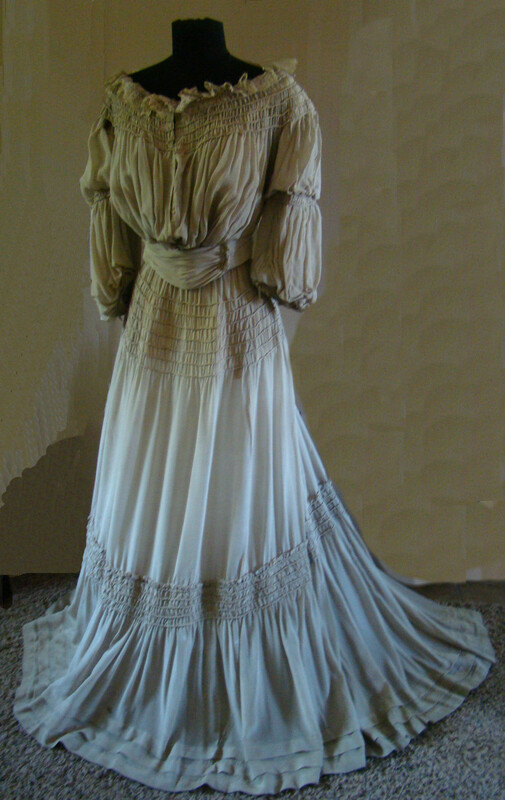 A wide band of corded and ruched trim circles the neckline, below the waist, and between the two ruffles of the skirt, which is bordered at the hemline by three horizontal pleats. The bodice has a 25" waist and 35" bust, is 12" long in the back and measures 13" between shoulder seams in the back. 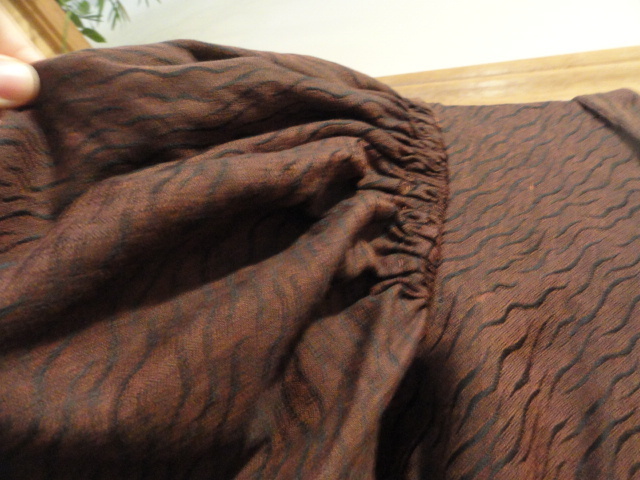 THe skirt is 23 in the waist and is 41" long in the front and 51" long in the back. 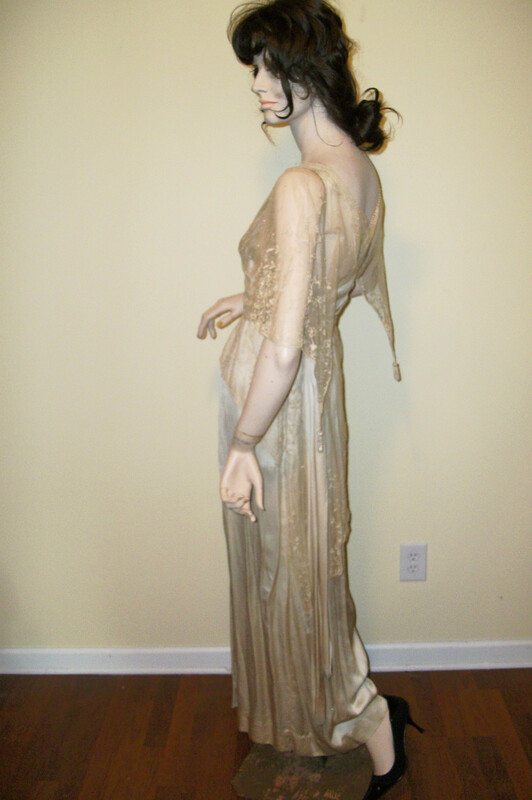 The dress was fully lined in weighted silk which has completely shattered. 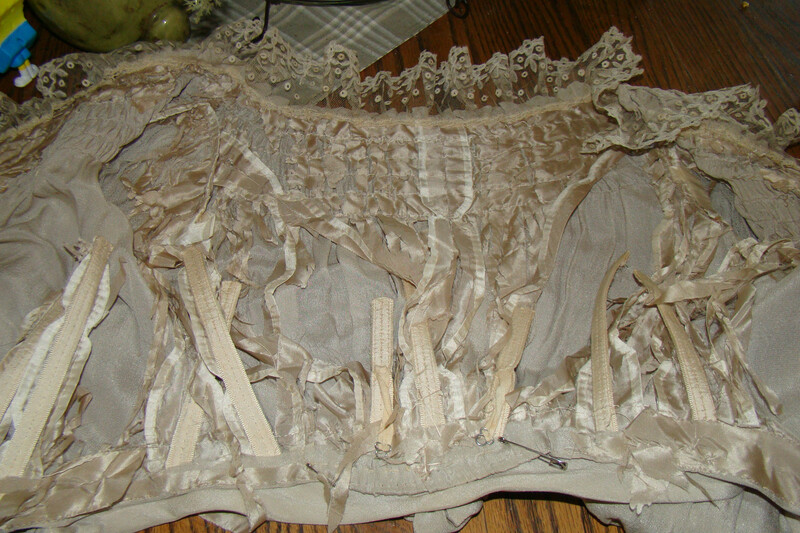 It has been removed from the skirt and is paratially removed from the bodice. 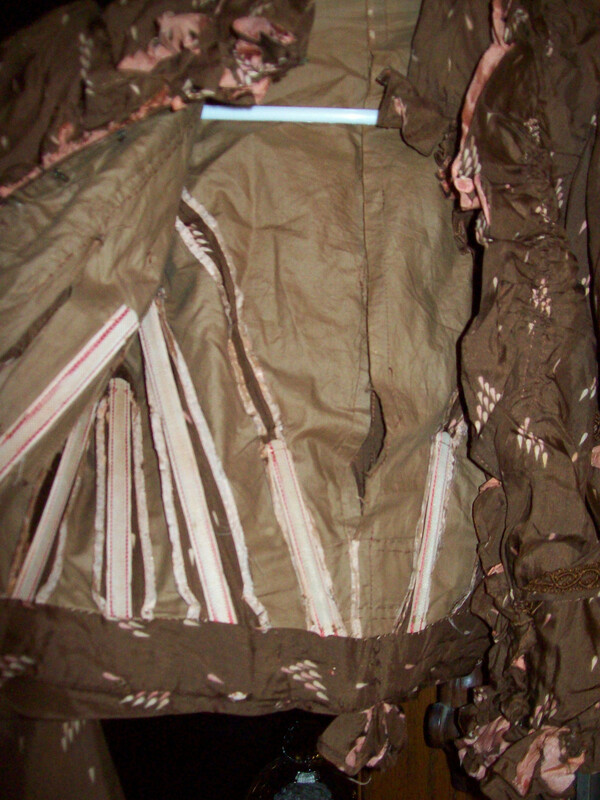 All of the stays are still intact and a skilled dressmaker could reline the bodice. It is usable for display and is a great collection piece. It has little other condition issues with some soiling around the hemilne where it has swept the floor. 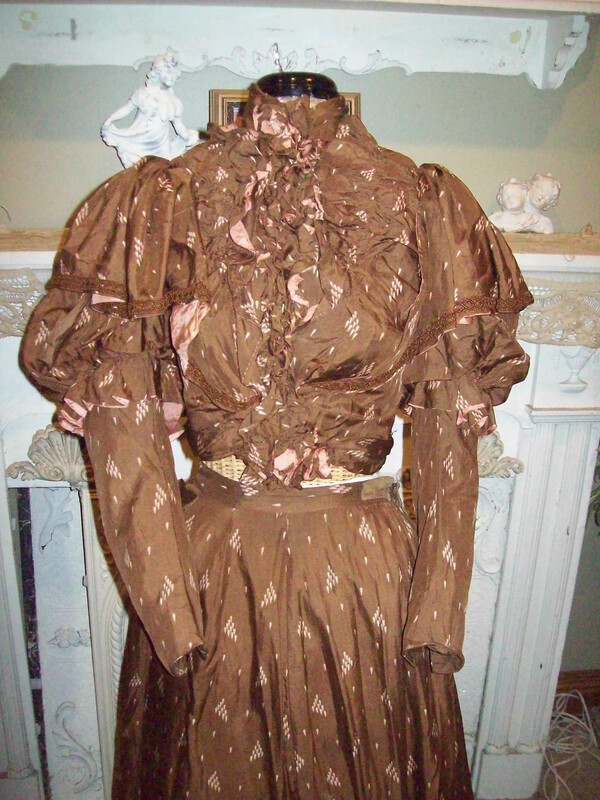 This dress is not wearable in its present condition, and has been priced accordingly. This is a very lovely example of a very late 1890's dress. Of course, no bustle would have been worn - it would have been worn with an S-shape corset. 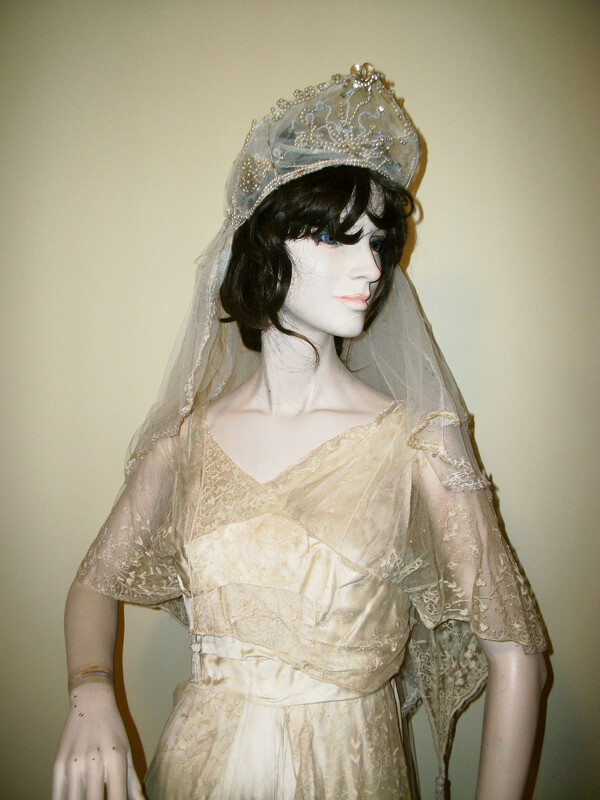 This is an antique Edwardian wedding gown in satin and embroidered lace with embroidered train length veil and crown head piece. It comes from the extensive antique clothing collection that was my mother and grandmothers and was started in the 1920's. The crown is built on a wire frame. There are pearls, irridescent milk glass beads, and rhinestones. Please use the zoom I have provided for you. As you can see, it is missing some stones. 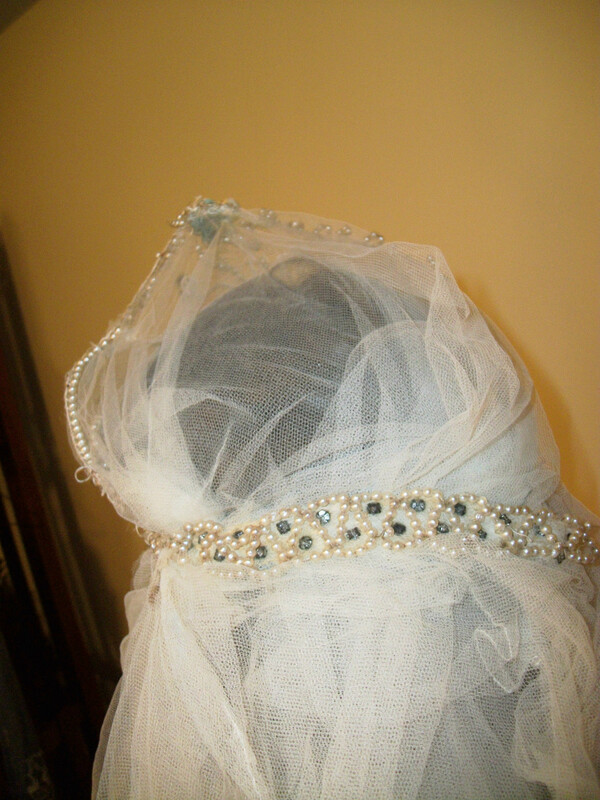 The back of it is rhinestones and pearls. The rhinestones have gone gray. All of the net lace (and there is a lot of it!) has scalloped lace as a hem. The train from the top of the crown to the very end is 104" the shorter veil is 25". There is lovely applied embroidery at the base of the train. There are some spots that will need tacking down again. The outfit will need to be cleaned as it has been in storage for some time. Remarkable I only saw three small holes in the net at the end of the train. The design is very angular and not symetrical in design. It is pleated at the waist in ivory satin that comes to a point at the breastbone. I wish I knew the names of laces, but since inheriting this collection I am still taking a crash course. In the meantime, I will let the pictures identify it for you.... and simply say it is an elaborate pattern of flowers, leaves and polka dots. There is a crystal ball with tassles that dangles down to the waist and two that hang down from lace points in the back. 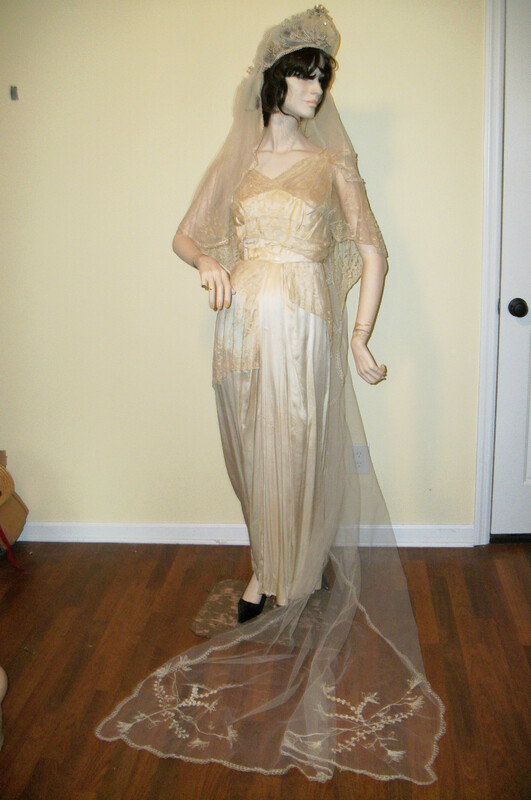 There is a faux overskirt in two lengths in the front as well. The neck is outlined in white milk glass microbeads. Just a couple are missing. The only fragile silk covers the breast area. It will need to be replaced or you could place a silk corset cover beneath it. I will be listing several soon. 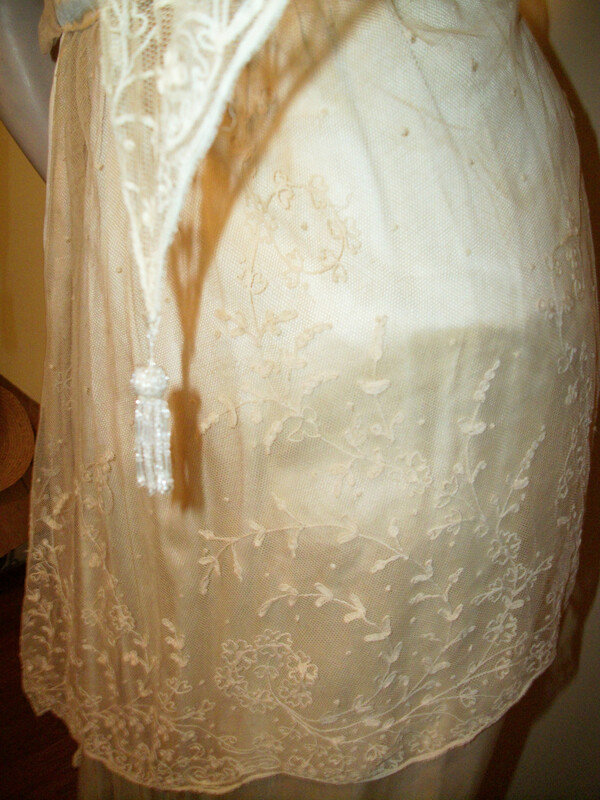 The silk and lace are lovely, tho it does need a cleaning as it, too, has been in storage for some time. This is a lovely dress and an excellent representation of the era. If you have any questions, please feel free to email me. Click on "see sellers other items" to view more from this collection. Like antique clothing? This collection of dresses and accessories is vast I hope you keep watching. I accept PayPal, and ship within two business days, and often the same day as payment. I am happy to combine items when possible. Shipping for this item is for the continental US. International bidders please note- I do not mark forms as gift . I prefer but do not insist upon shipping Priority Mail for international sales as it carries insurance and can be tracked. Customs fees are the buyers responsibility. I do not charge handling fees. This looks like it would be very easy to remake out of a sari. 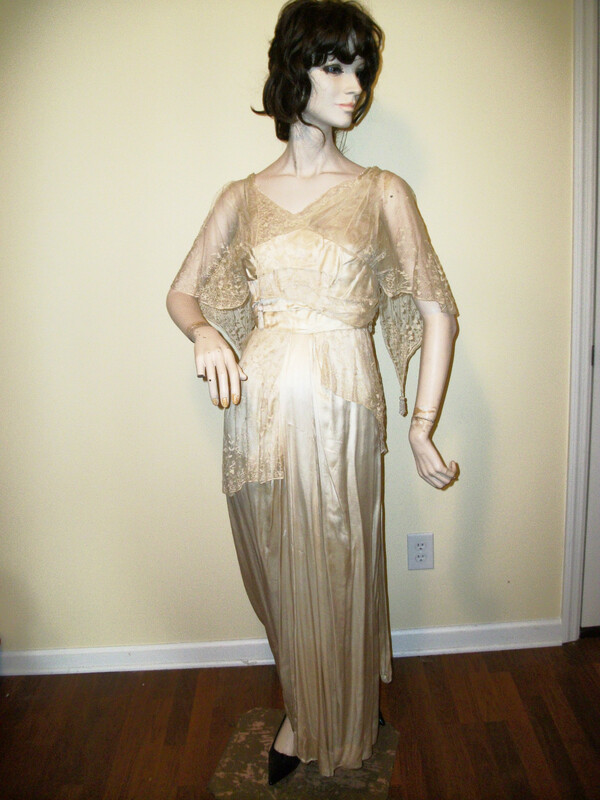 The dress itself is 1910's, not 1920's. 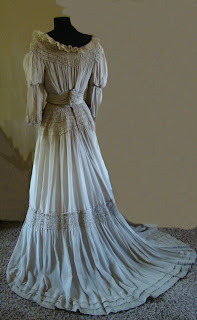 THIS IS AN AMAZING 3 PIECE WEDDING DRESS WORN BY A WOMAN NAMED MABEL FROM LONG ISLAND, NY , C. 1900-1903. 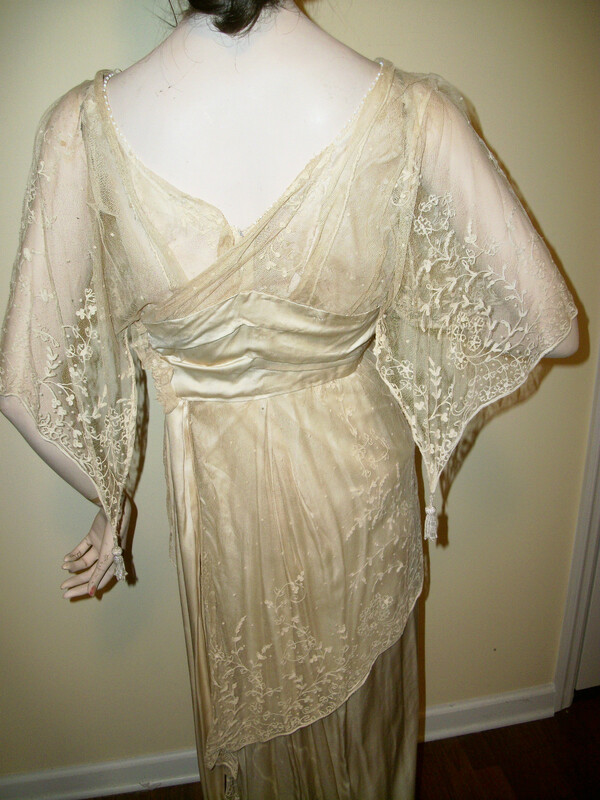 THIS DRESS IS BEAUTIFUL AND HAS BEEN IN STORAGE FOR 100 YEARS. THE FABRIC IS STRONG AND STURDY, NOT RIPE OR FRAIL. THE MATERIAL IS AN IVORY COLOR AND HAS A STRIPED PATTERN, ONE STRIPE SOLID ONE SHEER. I BELIEVE IT IS A SILK ORGANDY. IT IS A BIT STIFF AND HOLDS IT SHAPE WELL. THE 3 PIECES ARE BODICE, SKIRT AND SASH/ CUMBERBUN. THE BODICE IS TAILORED , HAS A LACE YOKE, BILLOWY PIDGEON CHEST , 3/4 SLEEVES THAT ARE QUITE PUFFY WITH DELICATE LACE CUFFS. THE NECKLINE IS HIGH , THERE IS A FAUX COLLAR OF LACE THAT STARTS AT BOTTOM OF UPPER BUST SEAM AND STARTS FROM OVER EACH BREAST THEN OVER SHOULDER TO BACK ,WHERE IT IS LONGER AND IS FLOUNCY. THE BODICE HAS DIAMOND SHAPE LACE PANELS IN FRONT AND ON EACH SLEEVE. THE BODICE HOOKS UP THE BACK AND HAS A PAIR OF SILVER METAL CONNECTORS TO ATTACH THE BODICE TO SHIRT. THE SKIRT IS 3 LAYERS. 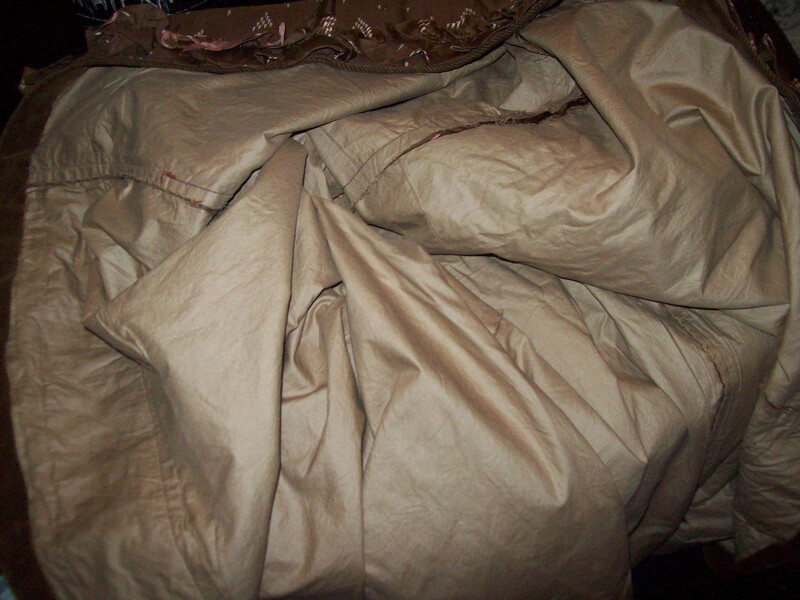 THE INNER LAYER IS A HEAVY , UNBLEACHED SILK OR SILK BLEND WITH SLIGHT HEM RUFFLE. 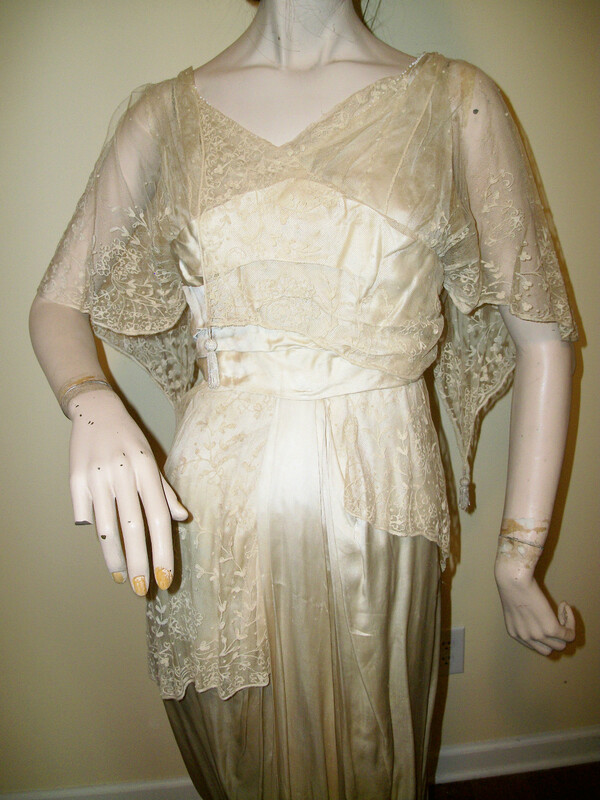 THE MIDDLE LAYER IS ECRU NETTING WITH A RUFFLED HEM AND THE TOP , SKIRT LAYER, IS AGAIN , ELABORATE . 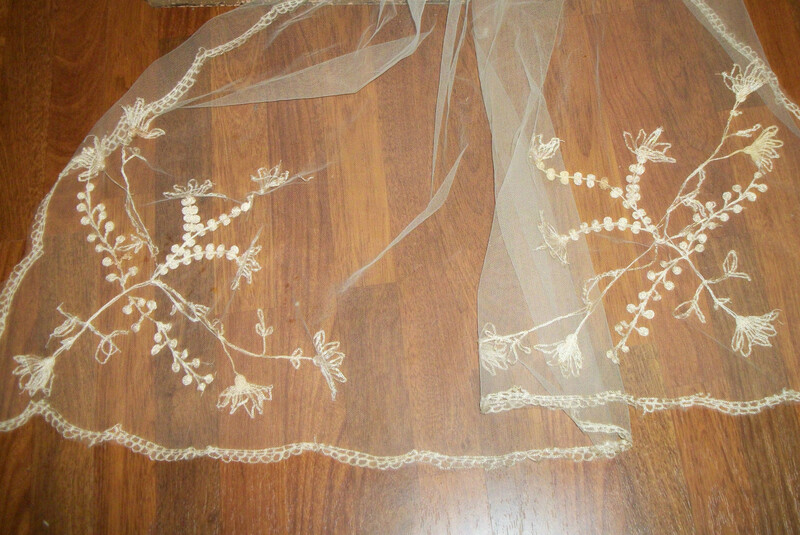 THERE ARE MATCHING LACE DIAMOND PANELS IN CENTER FRONT, HORIZONTAL LACE STRIPS, 2 HORIZONTAL FOLDED PLEATS , ANOTHER LACE STRIP AND ANOTHER DOUBLE HORIZONTAL FOLDED PLEAT AT HEMLINE. THE SKIRT IS A LITTLE GATHERED AT BACK CENTER AND A LITTLE LONGER AT BACK . 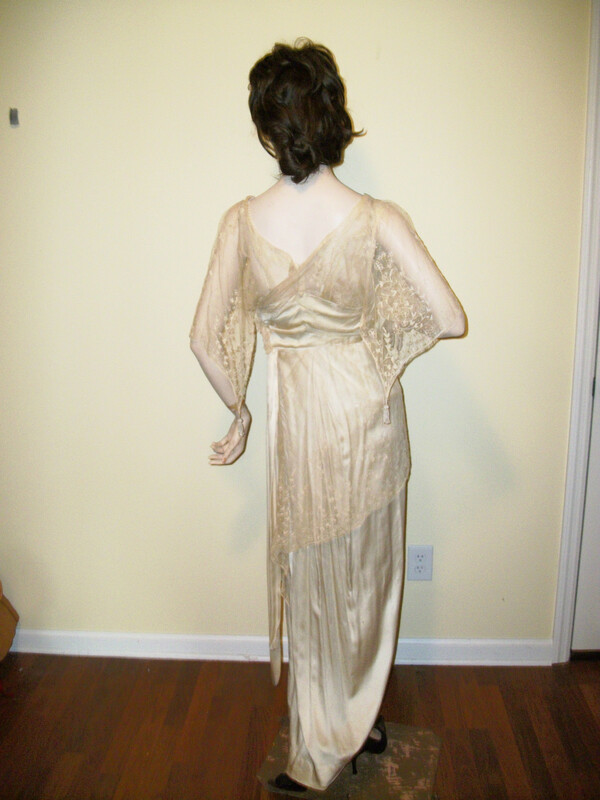 THERE IS A SEPERATE CHAMPAGNE SILK CUMBERBUN AROUND THE WAIST WITH A SMALL TAIL AT BACK. 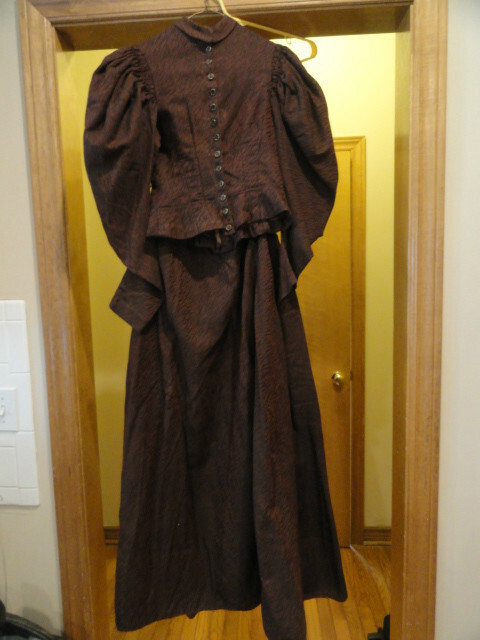 THE MEASUREMENTS : I HAVE MEASURED THIS OUTFIT ON THE VICTORIAN DRESS FORM, AS IT WAS PHOTOGRAPHED. SO THE ACTUAL NUMBERS MAY BE VERY SLIGHTLY OFF. 13.5" SHOULDERS , ACROSS BACK, INSIDE SEAM / 13" NECK CIRCUMFERENCE / 18" SLEEVE LENGTH /32" BUST / 23.5 WAIST , 6" BELOW ARM PIT CENTER / 30" HIGH HIP , 11" BELOW ARM PIT CENTER / 48" SKIRT LENGTH, BACK / 41" SKIRT LENGTH , FRONT / 17" LENGTH BODICE, TOP OF SHOULDERS TO SKIRT TOP ( NOT INCLUDING WHAT WAS TUCKED IN ). THE CONDITION: FOR IT'S AGE I RATE IT AS 80% -- 85% PERFECT. IT DOES HAVE SOME ISSUES . THE BACK OF THE LEFT SLEEVE HAS A LITTLE DARK MARKS RUNNING ALONG STRIPE EDGE, THEY ARE FAINT. ON SKIRT BACK, SLIGHTLY TO LEFT, ON SECOND LACE STRIP AND SURROUNDING , IS A DARK BROWNISH STAIN(PIC) 6" X 4" APPROX, NOTICABLE MORE ON EDGE OF LACE. IT IS NOT SOLID OR WHOLE. THE AREA LOOKS LIKE IT MAY HAVE BEEN CLEANED. LOOKING AT IT I BELIVE IT WILL CLEAN AND FADE EVEN MORE IF DONE PROPERLY. IT'S NOT OVERLY NOTICABLE. THERE ARE SOME YELLOW SPOTS ON HEMLINE AREA , SKIRT FRONT. 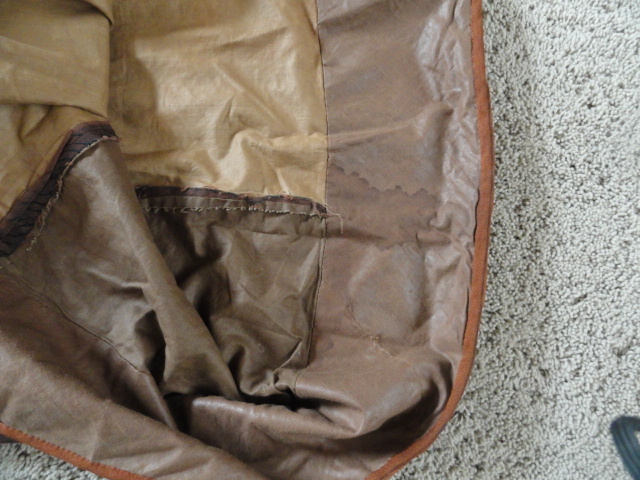 THE INNER LAYER OF SKIRT HAS SOME STAINING AROUND WHERE THIS SKIRT STAIN IS. IT ALSO HAS A FEW SMALL HOLES IN HEMLINE BACK. 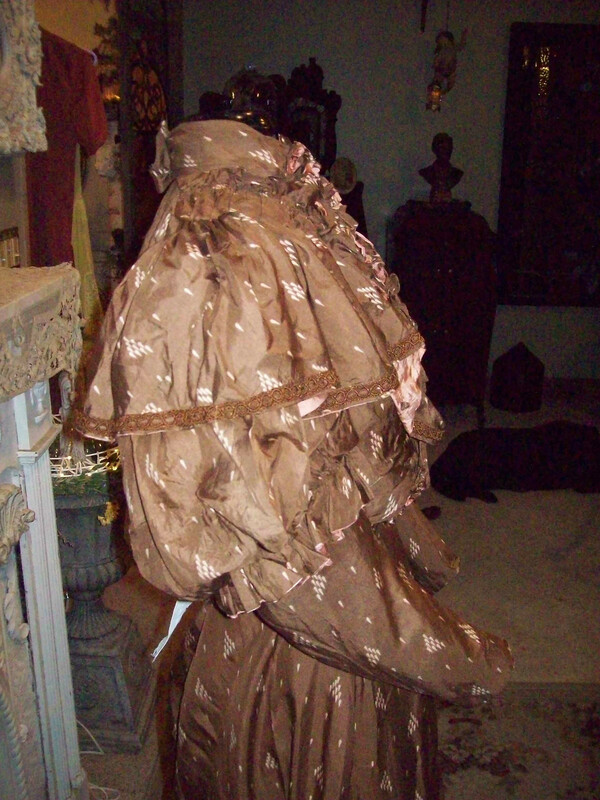 THE MIDDLE LAYER OF SKIRT, NETTING HAS SOME HOLES IN BODY AND RUFFLE. THE CUMBERBUN HAS SOME STRESS DAMAGE, THINS RIPS IN FOLDS. tHIS OUTFIT COMES WITH THE EXCESS OF ORIGINAL FABRIC . IT IS A 12" BY 23" APPROX LENGTH. THIS PIECE DOES HAVE SOME SLIGHT STAINING ON IT. NOT ALL OF IT. THERE IS ALSO SOME SCRAPS OF FABRIC. AS YOU CAN SEE FROM DESCRIPTION AND PHOTOS THERE IS A LOT TO THIS. I HAVE TRIED TO SHOW THE HIGHLIGHTS. I HAVE MORE PHOTOS, AVAILABLE UPON REQUEST, THAT SHOW IN DETAIL SOME OF THE ISSUES. THIS IS A PIECE THAT I BELIEVE CAN BE ALTERED TO ADD A LITTLE OR TO USE AS A PATTERN TO MAKE INOT A MODERN SIZE. IT IS BEAUTIFUL JUST SITTING ON A DRESS FORM. IT IS VICTORIAN AT IT'S MOST BEAUTIFUL ! THANK YOU FOR LOOKING AT MY LISTING. I AM ALWAYS HAPPY TO ANSWER QUESTIONS AND INQUIRIES. This is so sweet looking. 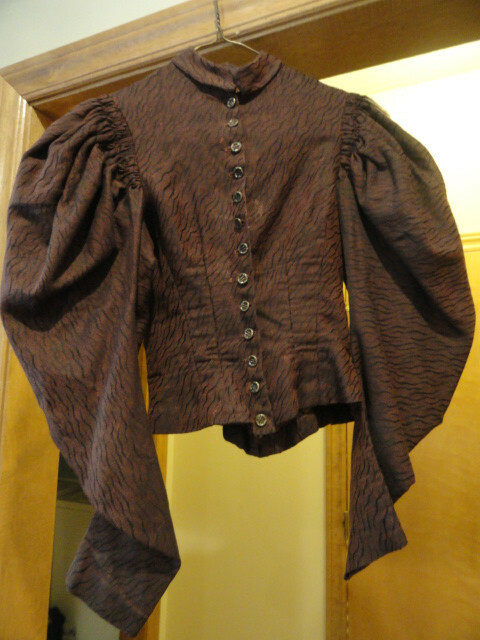 Based on the "puff" of the bodice, my guess is this really is from the 1900-1903 time frame. So, extremely late Victorian/early Edwardian. This is so cute! I love the pink accents. 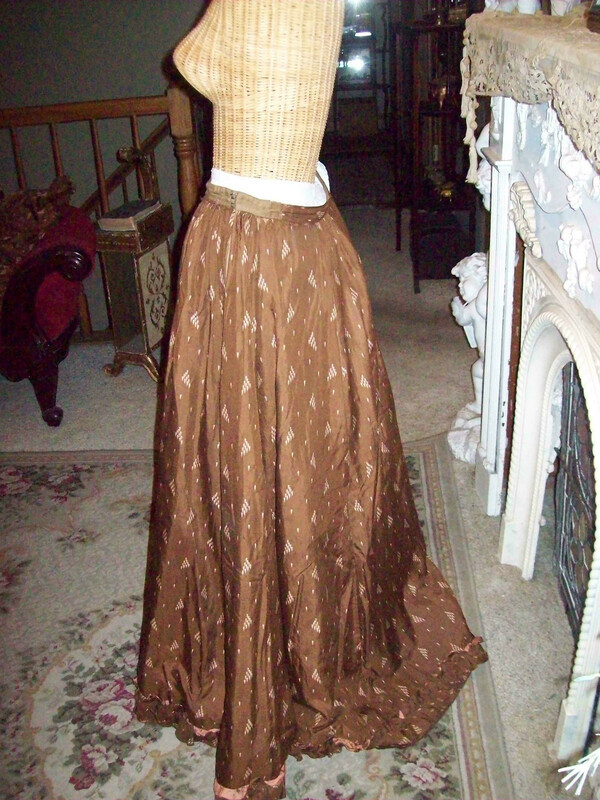 UP for auction is an antique ladies long burgandy raw silk skirt with little black squiqqly lines and matching jacket. 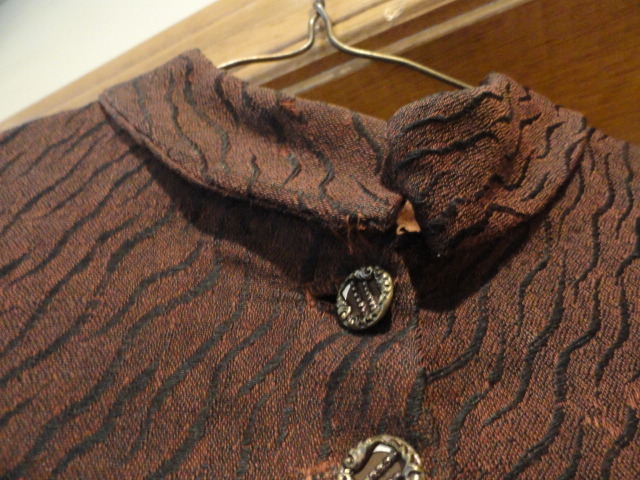 The jacket has little metal buttons which are dainty and feminine. All buttons are present and original. The cut of the jacket is superb with full sleeves ending in a point over the wrist and a tailored bust and waist with boning. 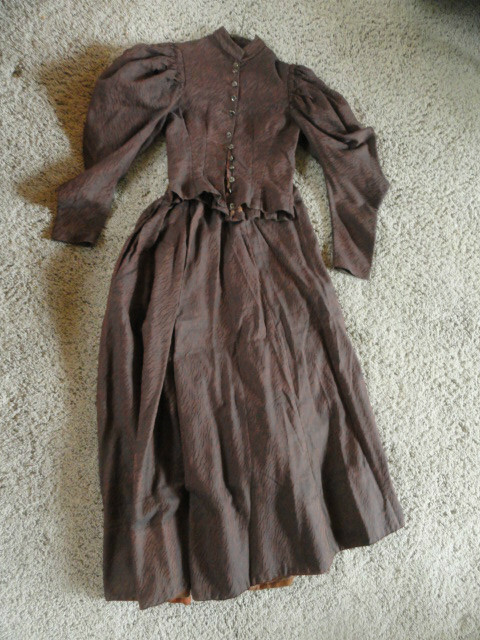 The sleeves are large and gathered at the shoulder.The skirt is missing its original button and looks to have been taken in some. I believe this would be an easy fix to make it wearable. It's definitely wearable and could be let out if needed. 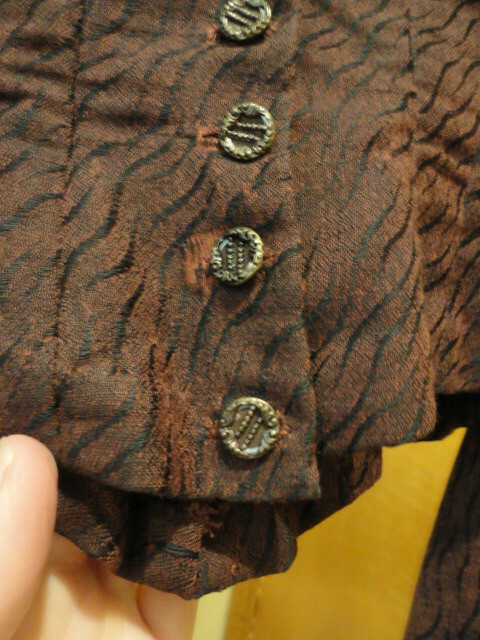 There are a couple of small wear places in the pattern on the fabric on the jacket but no holes. 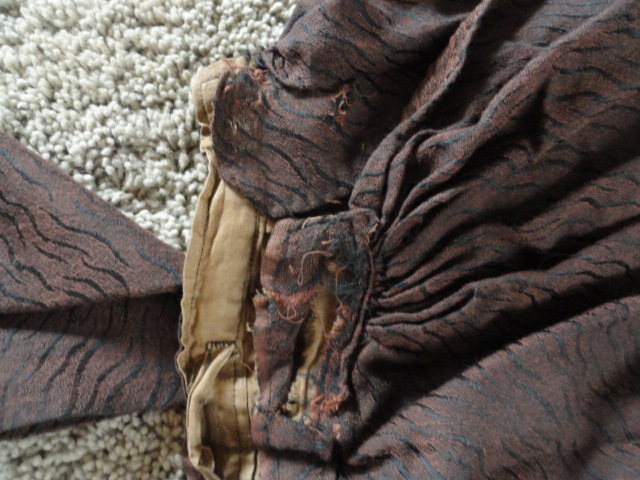 There is some staining inside the lining of the skirt and some wear around the waist. 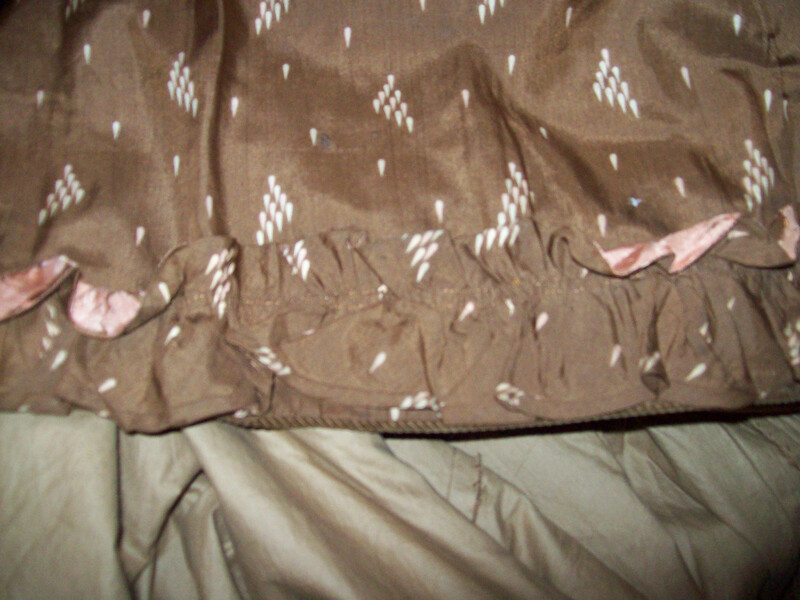 I also took a picture of the lining of the skirt so you can see what fabulous condition its in. There is no label inside. This is straight out of Sweeney Todd--something Helena Bonham Carter might have worn. Perfect for a personal or museum collection and even great for Cosplay--very Steampunk! skrit width: full circle and fully lined. 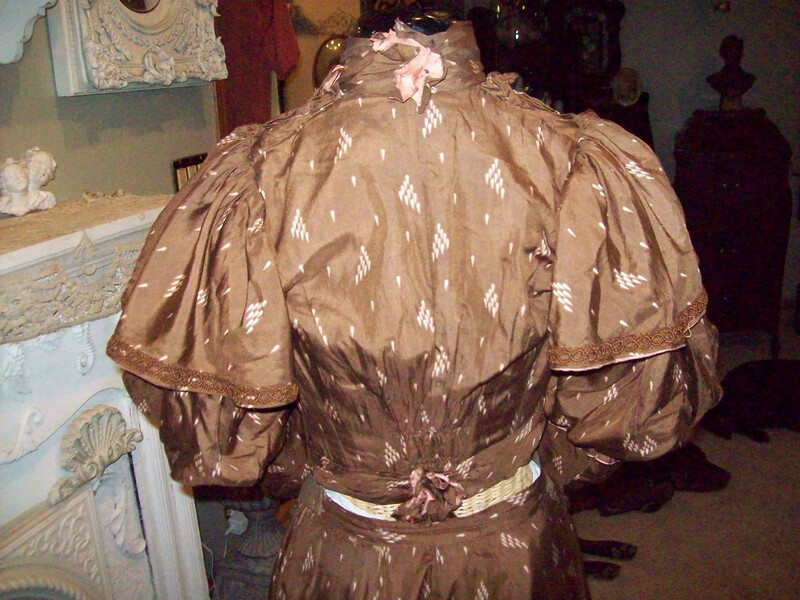 jacket bust: lying flat from pit to pit: 17"
jacket sleeve: from top of shoulder seam to bottom of cuff: 29"
I have for your consideration a wonderfully unique authentic antique Vintage Pre Victorian 1860's 1870's Civil War ERA Ladies brown and black heavy floral print prairie dress with beautiful buttons and brown velvet trim Is ALL handstitched. Is NOT a reproduction. Has a built in waist cincher and is lined in brown dyed feedsack material with the paper feedsack label still attached in places! 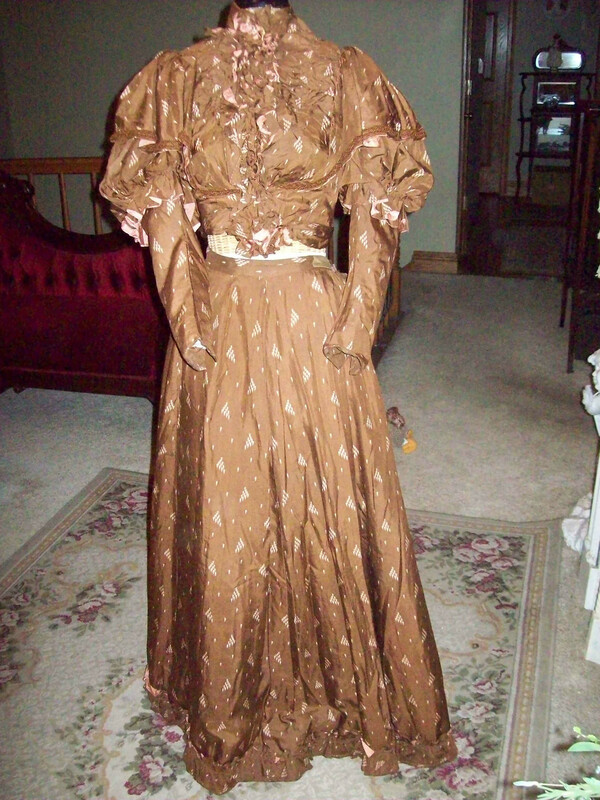 This dress is phenomenal has the most delightful Civil War ERA details including material itself. The fact that it is longer in the back than the front to allow for a bustle. Gorgeous brown velvet trim at the high neckline bodice back and them. 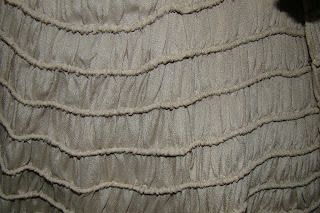 It also has a fantastic row of ruffles just above the hips at the back. Is entirely handmade as can be seen from the stitching in my close ups of the interior. Interior Closure is entirely metal hook and eye exterior buttons up the front with fantastic multi color buttons (not sure of material buttons are made of). The fabric is phenomenal please see all of my photos. This is extremely form fitting at the bust, bodice and waist. It has some condition issues, but considering it's age of over 150 years old, are in my opinion very minor. There is some shredding under one arm as I have shown in close up photo. There are also several holes in the front of the dress but is not shredded and are not gaping can be repaired. The velvet at the bottom of the skirt is worn in places. The button holes will need to be restitched as they have torn but not so much so that they cant be repaired just a few stitches and good as new. Other than this I do not see any Major condition issues just a few as described above. I have seen clothing from this era in tatters and this dress is definitely worthy of being displayed not just studied!!!! If you are tiny it could even be worn but I would not recommend this due to the age but will leave that up to you! JUST short of being MUSEUM quality. I purchased recently at a local estate auction. 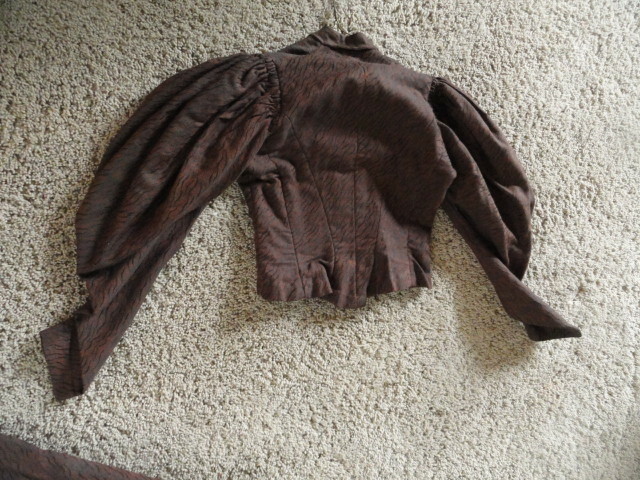 Bodice Measures 13 1/4 inches from top of shoulder to top of waist. Length - Ankle length to be worn with lace up boots longer in back than in front 51" inches shoulder seam to bottom of hem in front. I have not done anything to clean this dress as I did not want to risk damaging it. It may have odors from its previous life. I did not notice anything highly offensive. Please bid carefully as I do not offer refunds unless an item is grossly misrepresented and is being sold as found as is with no refunds or gaurantees. This looks to be from the late 1880's/early 1890's. The puff at the top of the sleeve gives away the date. Although some of the styling looks earlier, that could be from one of two reasons: the dress was from the early 1880's and redone as the styles changed or the lady who created the dress liked some of the earlier styling and added them to her dress. Either way, I wouldn't put a date earlier than 1875 on it.